Egg Sale? Are You Crazy? Our eggs are on sale again. No. I’m not crazy. I can do math. I have X birds. They eat every day whether they lay eggs or not. They use roost space eggs or not. They need to be protected eggs or not. The costs of the bird, the feed, the housing and the fencing are fixed. What varies is the number of eggs. Let’s make the math simple. Let’s say I have 100 birds. I can normally count on 100 birds laying 65-70 eggs. But egg production varies seasonally. We get few eggs when the days are short. We get few eggs when the weather gets hot. We get many eggs when the birds are young, fewer when they get older. They take time off each fall to molt. This is a biological, not mechanical, system and, consequently, it varies. But, again, what doesn’t vary is the cost. I own the fence and the birds…now I have to pay for it. So let’s say the flock costs me $15/day to maintain. When the birds lay 66 eggs, 6 are going to be cracked, checked or misshapen and can’t be sold. That leaves 5 dozen for me to sell. I’m not going to work for free so we charge $4/dozen for our eggs and we bring in $20 gross, $5 net. Right now the flock is laying more like 90 eggs/day. That’s more eggs for no additional cost, even if I can’t sell 10% of them. I add in two additional cartons ($0.30 each), and have more eggs in my egg case than my regular customers can buy. As nice as it would be to bring in $28/day, I need to sell those eggs, not feed them to the pigs. This is my chance to attract new customers. I run a 25% off sale. Folks who think $4 is too high for eggs are happy to pay $3. If I get $3 for 7 dozen eggs I’m grossing $21/day. The extra cartons knock me down to $5.40 net. That extra $0.40 is probably absorbed by the extra tray space and wash/sort time. Now, some suggest that I should use the surplus cash coming in right now to make up for the expected shortfall this winter. I think that is sound theory except for two things. First, we have a new layer flock coming online soon and should not see much of a winter production drop. Second, I don’t know what to do with all the eggs I am collecting these days. Let’s go drum up new business! Eggs are a little more than a labor of love anyway. I’m collecting more eggs for the same cost. I’m gaining exposure to new customers. I’m making more money at the end of the day…even with cheaper eggs. But the real question is, “Why are we getting more eggs?” Good question. I think it comes down to management. Not only are we collecting more eggs overall, we are collecting more salable eggs. I’ll start with the salable eggs. With our old hoop-style chicken house we had to bend down to go in and collect the eggs…so we didn’t want to do it very often. So most days we would just collect eggs once each day. When there are more than 4 or 5 eggs in a nest box the birds tend to crush an egg or two, smearing the remaining eggs and nesting material with broken egg mess and bits of shell. Now that we can collect the eggs outside of the structure while standing we don’t seem to mind collecting eggs late in the morning and again in the evening. We are also doing a better job of keeping fresh, clean nesting material in the boxes. 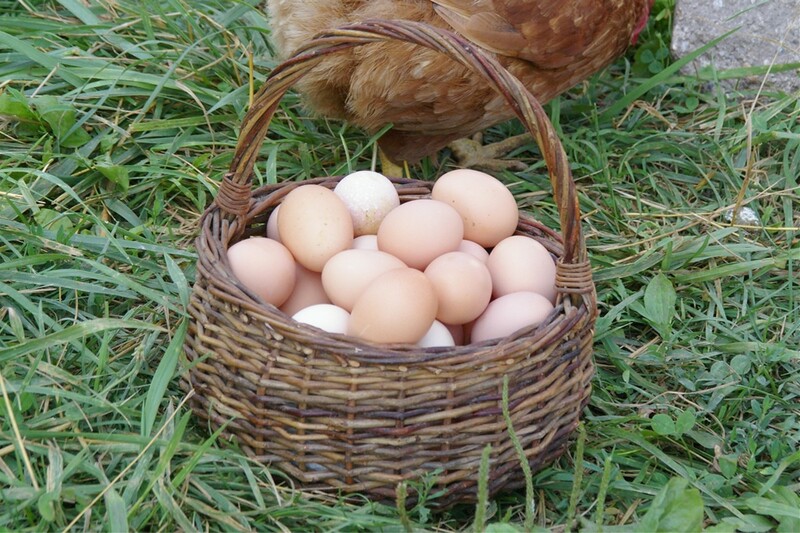 As a result we are able to sell a higher percentage of the eggs we collect. But we are also just getting more eggs. To the point that I plan to add another nest box array. Some of this is seasonal. Longer days and unusually cool weather make it better for the birdies. But I think most of it is due to recent changes to our housing situation. We built a new layer house on wheels. I insulated the roof of the building and provided for excellent ventilation. The high yesterday was in the 90’s but inside of the building was cool and breezy. I was removing soiled bedding from the interior of the house and dust was not a problem. I wasn’t even warm until I stepped out of the building. Beyond the house, we have just turned our birds free. Grandpa’s rock collection spans most of the farm making it difficult to step in fence posts for netting so we are just letting the older birds run. That creates a few real problems like predation, hidden eggs and birds roosting in strange places. However, the birds are able to scratch and gather from a much larger area, lowering their feed consumption. They especially seem to like the horse stalls where they find undigested oats. This would work much better if we had a larger farm. If we had 300 acres (and 150 cows) we could move the chickens further each time, keeping them busy in new places. I’ll have more to say about fully free range birdies another time. Back to the point, more food, less heat, better housing, more convenient nest boxes…these things all combine to break all records for egg production on our farm. It’s not uncommon for us to collect 100 eggs from 110 birds. So eggs are on sale right now with the hope that we can establish ties with new customers…customers who were reluctant to give us a chance at $4. With luck, they will try our eggs, notice the difference and offer us additional chances in their kitchens. 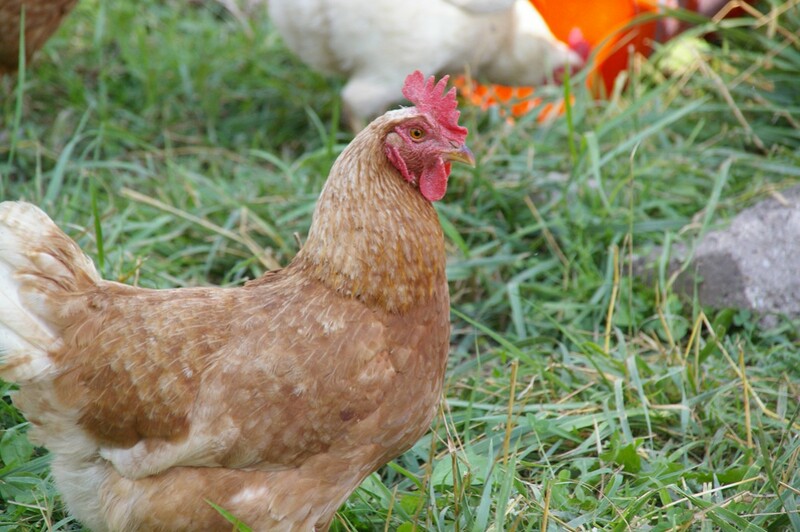 This entry was posted in Farm Finance, Pastured Poultry. Bookmark the permalink. You need to send those eggs my way – due to a different market, I can sell them for up to a dollar more (CAD admittedly). Not only that, I am down to a dozen a day from 45 hens, and my customers are in withdrawal. My future egg layers are a week old tomorrow, so it’ll be a while till they’re producing. Of course, that won’t help build your customer base…but mine will be much happier :). Free ranging is causing part of my egg drop – probably half of my birds are laying in hidden nests. And I totally agree that clean reachable nests make a big difference. Yeah. We have had to hunt eggs a little bit. Gets old. But these are our old hens and they are fattening nicely. @ Dawn – you likely need the extra $1 on your eggs to cover feed costs? We hear horror stories on the Prairies sometimes about sml square hay bales selling at $20 each on the Island, hopefully somewhat of a myth? My friend and her hubby were stationed at Comox Forces Base one time and she took her horse over and board was pretty dear so there could be some truth to that. Either way I imagine your feed costs are higher and you would have a higher cost to ship chicks over too? Yes, it’s true, my $4.50/doz accounts for feed, which is about $13/bag (20kg). I still make a profit though – not huge, but I consider it pretty fair for the amount of labour that goes into the layers (ie they’re pretty low maintenance). Horse boarding and hay: You probably know that the Island is an equestrian hotbed – maybe not quite Spruce Meadows, but lots of stables training at that level. It has distorted how horses are cared for in a big way. For the most part, NONE of the boarding stables would think of feeding local hay – it’s low in protein, it’s high brix, it’s low this, high that…poor leaf, too much stem, etc, etc. There is no monocrop hay to be had here – it’s all mixed – usually a timothy mix. So yes, the bigger horse stables are buying in truckloads of hay from AB, and yes, the bales (small) are $20/each. So is straw coming in over the Rockies – and people buy it. To be fair this has only recently begun to be a mainstream thing – it began about two years ago when we had a terrible hay year here and there was no edible hay to be had here. I grew up as a Pony Clubber, my ponies lived out in the fields, came in at night, got hay (ours – mixed, stemmy, weedy, whatever), might have got some bran mash in the winter, and some pellet feed if I was getting a lot of riding in. They looked pretty Thelwell, but everyone’s pony did then – the 1970’s, and just about everyone with an acre or two had a Welsh cob or a quarter horse cross living on it – not costing a lot more than a bag of feed a month. They were mostly healthy, hardy and long lived. Nowadays, people know what breeds there horses are, they live inside on rubber mats, and get to go out on hog fuel paddocks (so they don’t eat anything green by accident). They get special feed, added minerals, and hay from Alberta. It’s an expensive hobby. Sorry for the rant. It’s about to be a bigger problem than people realize too – because hay is still considered a crop that qualifies a farm for farm tax status – even if it’s sold to horses. Here on the island, the only people doing dairy grow their own hay, the beef and sheep people ditto. So all the people getting cheap property taxes are about to have no buyers for their hay. @ Dawn – yikes $20/bale is not a myth! Do your horses consume all of your hay or are you affected with no one buying your local hay? If so, it could be an opportunity to get some livestock and take advantage of the hay no one will buy – assuming it is reasonably priced? So would the $15/day just include feed or is there something in there to amortize the costs of their fancy mobile coop, fence and equipment? 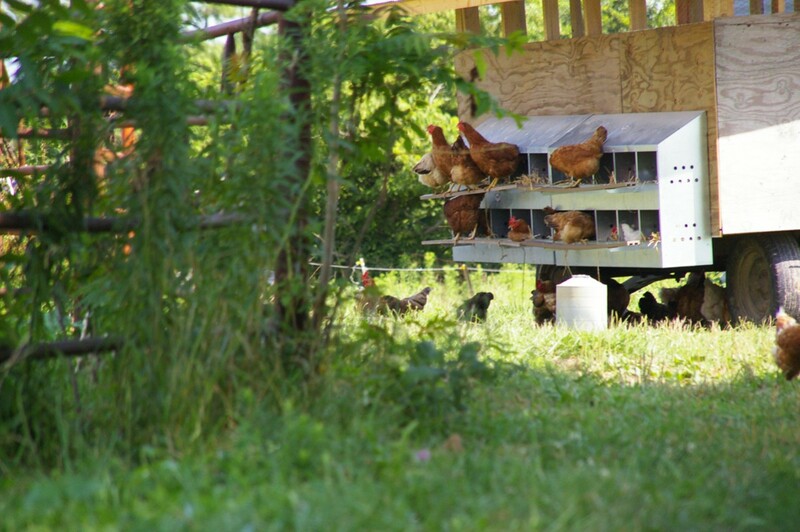 Do the birds go into their new coop on their own now at days end or do you still need to manually put them to bed? That’s the rough number I’m playing with today. There is a blog post here somewhere about egg costs but, yes, that’s roughly the whole shebang. There are 5 or 6 that just won’t take the hint. One is in a nest box every night. Igor is under the wagon about half the time. This morning we noticed 2 that went camping. I know we are losing a few eggs. I may get past the rocky area and go back to fence. We’ll see. Have you done the math on feeding them to the pigs? Walter Jeffries keeps his flock just for feeding pigs. I have looked at that. Also at dairy for protein. We just have our toes in the water. Non-soy livestock protein is a real problem. It is a challenge. I use wheat middlings & barley combined with whey/clabber on the pigs….and that can take quite a few cows for more than a handful of pigs. But eggs and/or clabber should make pig feed protein easier. I am experimenting with earth worms & black soldier flies to eliminate fishmeal in chicken feed. I already make “chicken cheese” from the clabber but I am still concerned it is not enough protein for the birds so continue to add the fishmeal. If other readers have no idea what we are talking about, here is a link to a comment Walter left on Matron’s blog this past spring.